Reduced to clear! BP-MB90R2LCPF-CC3. Bitspower G1/4 Matte Black Dual Rotary Angle Compression Fitting CC3 for ID 3/8" OD 5/8" Tube. 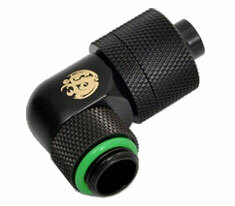 Features a threaded port on one end and a compression fitting on the other for a smooth 90 degree direction change.